2008 Audi RS4 Convertible Quattro AWD -- RARE 420HP 6 Speed Manual! Navigation, Leather, Bose Sound, etc. GREAT Condition!! Well maintained & LOW Priced!! -- 2008 Audi RS4 Convertible Quattro AWD -- A Very RARE 420HP Convertible 6 Speed!! Comes with a good service history since new; most work was done by Audi dealer. Original price $84K !! This is a smoke-free convertible,​ clean title,​ clean Carfax History Report. Price JUST REDUCED!! There are no mechanical issues and all functions work properly. This RS4 looks great,​ no dings and no dents! Interior is very clean,​ there are no stains and only minimal wear is visible. The RS4 has a 420-horsepower V-8 engine and a 6-speed manual transmissions. The 60-mph sprint takes less than 4.8 seconds. The RS 4 cabriolet is more exclusive than Audi's $115,​000 mid-engined R8 supercar,​ as just 300 of these RS 4s will be sold in the U.S. In crash tests it received a perfect 5 stars in the NHTSAs driver side-impact test,​ along with 4-star rating for frontal impact and passenger side impact tests. The rollover protection rating is a 4 of a possible 5 stars from the NHTSA. Comes with 2master keys, all manuals,​ mats and tools. Inspections are welcome. Please call (561)-889-2933 for an appointment. NO dealer's fee. Cash Price. We do not offer in-house financing but credit union and other financing institution's checks are accepted. Let us direct you to the right bank if you need help with financing. Trades are welcome and we usually beat most other offers. 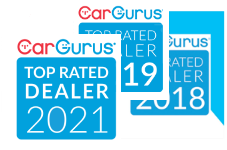 We have been named Top Rated Dealer for 2017 and 2018 by CarGurus; buy with confidence,​ as our dealership sells superior quality vehicles and provides best customer experience before and after the sale.